All the prophecies converged in one moment, for “the fullness of the time had come.” (Gal. 4:4 NKJV) So, a young, pregnant girl named Mary and her espoused young man, named Joseph, leave their home in Nazareth to travel to the homeland of their forefathers in Bethlehem to be enrolled according to their families for taxation. Once in Bethlehem, they search diligently for a place to rest as the baby was about to be born. Only an animal shelter is available because there is no room for them in the inn. As a hush descends over the earth in the wee hours of darkness, the cries of a newborn pierce the gentle silence. Meanwhile, wondrous songs of praise by a host of angels saturate the skies over the fields tended by shepherds, filling the night air with the glory of God. During those dark hours, Christ comes. In that humble place, to the gentle lowing of the cattle and the bleating of the sheep, Mary gives birth to the Saviour of the world. Swaddling Him lovingly, she places Him in a trough, and there, the miracle of the manger takes place. The empty manger, the vessel cradling the tiny body of mankind’s salvation, is full – full of love, full of expectation, full of holiness, and full of humanity. It is an earthly visitation of the heavenly realm. 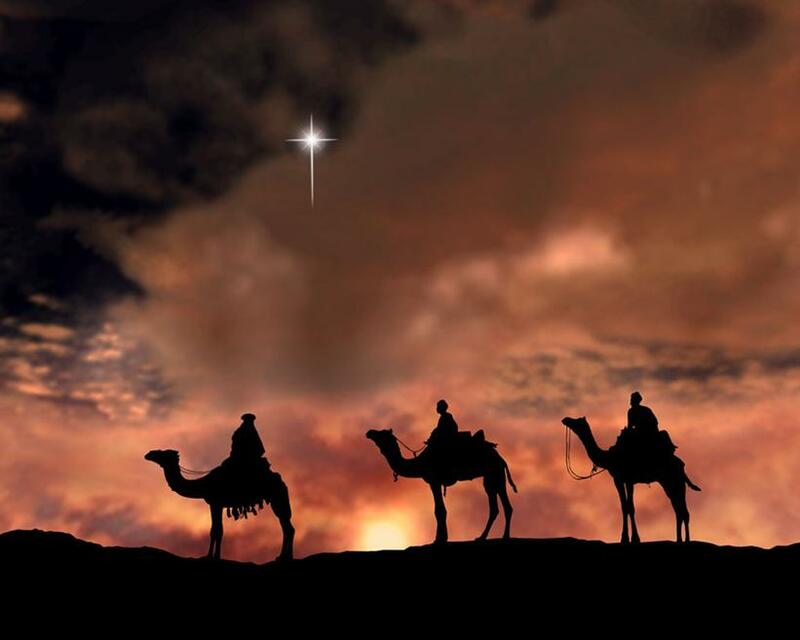 A divinely appointed star blazes triumphantly in the eastern sky, proclaiming, “This is the way to the Christ-child.” Its brilliance appears even in the distant land of the Orient. Men, wise in astrology and the prophecies, set out from this land to seek the One upon Whom the star shines, the newborn King. When the wise men come to Bethlehem, they come bearing gifts, first out of their hearts’ fullness, for they fall down to worship the Christ-child, and then, out of their treasure bags fullness of precious things, for they offer gifts of sacrifice. When the wise men come to Bethlehem, they bring gold, one of the purest and most valuable of all metals. It serves to remind us of that which is of genuine worth and value, as it was lavishly used to cover the articles of the temple and the temple itself. It reminds us, too, of the pure worth and value of Christ, and that He fashions our hearts into the pure gold for His temple, the home of His holiness and pureness. When the wise men come to Bethlehem, they bring frankincense, a sweet, aromatic perfume, burned as incense, and, among other things, was an ingredient in the anointing oil. It serves to show us the precious Holy Spirit, anointing us to be in the presence of the Father, as the incense mingles with the sweet-smelling sacrifice of prayer, rising to the throne room and lingering at the Father’s feet. When the wise men come to Bethlehem, they bring myrrh, a fragrant, costly perfume, used in purification rites and for cleansing, also as an ingredient in the anointing oil, and used for preservation in death. It represents the costly perfume of Christ as His blood purifies and cleanses us, preserving us in death. Out of love, God gave. Out of love, Christ came. Out of love, the wise men came and gave. The wise men found Bethlehem and Bethlehem found its way into their hearts. Where will Bethlehem find you? In the car sitting in snarling traffic, snarling back at it? On the way to Grandma’s house, Aunt Sophie’s, or Mom and Dad’s? On a plane, or a bus? Or perhaps at the mall, rushing to find that last minute gift? Will it really find you there? Does it come rolling in with chariot wheels rumbling? Or does it come silently with a gentle whisper? Does it come in a season, or in a moment, in the twinkling of an eye? Have you found Bethlehem? Have you knelt at the manger of the Christ-child? The only way you will find Bethlehem is when you remember to kneel in worship to the Christ Who loved you so much that He came in a tiny human form. Do you bring the sacrificial gifts out of your heart’s treasury to the Christ-child? The purity of holiness? The costly fragrance of continual prayer? A cleansed soul, preserved from eternal death? Do you offer Him your heart as His manger, as the vessel of His resting place? Or is it full of jealousy, envy, hatred, unforgiveness, self-pity, lust, anger, or prejudice? Is there any room left for Him to come and “lay down His sweet head”? Have you said, “Sorry, there is no room for You in this inn”? Wise men give Christ room to dwell. Will you be a “wise man” this year? Will you visit Bethlehem this Christmas? Will its Visitor visit you? Will your inn have room for Him? Or will Bethlehem come and you will have missed it? Make room for the Christ-child; make room for the Christ-Man. Give Him the lodging place He deserves. Be as the wise men when they came to Bethlehem: worshipping on bended knee, grateful, and bringing gifts. When wise, men come to Bethlehem! I pray abundant blessings for you and your family, for a Christmas filled with the miracle of the manger, the presence of the Christ-child and the Christ-man. May you be wise and find Bethlehem…and may it find you.